Any Washington Beltway Bandit will tell you that money, power and a smart lobbying in the back offices are how bills get passed in the US Congress or Senate. Definitely, some pretty powerful support for this legislation. Add in the drug companies who were also backing the bill, and you’re looking at the most intimidating lobbying effort that special interests in Washington can muster. But this week, Goliath met David on the Internet. Although the anti-SOPA effort had some pretty powerful players of their own — Google, Wikipedia, Facebook, et al — it was really a classic Internet grassroots information campaign that brought attention to this bill. SOPA was on all the morning talk shows, evening news: Google and Wikipedia led the blackout, zillions of emails were sent, and your friendly congressman had a big fat microphone shoved in his face demanding why he supported it wherever he ventured out. I guess they just don’t like too much attention. 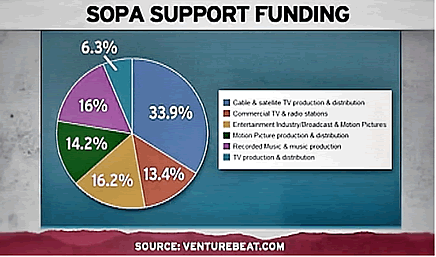 As it stands right now, it looks like both SOPA and PIPA are dead… but you can be sure they’ll be back. Keep fighting! Internet 1 Washington 0! Please leave your comments below, or text Robert at 604-262-5262. Have a great week.